TheReadingWarehouse.com:A New Trip Around the World, Grades K - 5:Leland Graham, Ph.D.
Annotation: Take students in grades K–5 on a field trip without leaving the classroom using A New Trip Around the World. 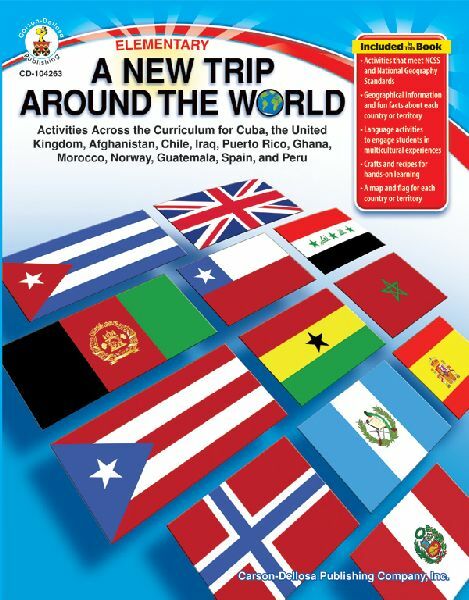 This 128-page book explores life in and geographical information and fun facts about Puerto Rico, Guatemala, Cuba, Peru, Chile, Spain, the United Kingdom, Norway, Iraq, Afghanistan, Ghana, and Morocco! The book enables students to discover the world through art projects, recipes, flags, maps, and language studies. This amazing classroom supplement supports NCSS and National Geography Standards.